Soul Food for Young Adult Communities,- Feast of the Most Holy Trinity, May 26, 2013. Letter to Sinead, Mark, and Friends,- young adult seekers. Some of the most wonderful things in life are very ordinary. Like a parent’s love, or the love within a family, or a special time of conversation with your grandmother or granddad. Nothing earth-shaking, very ordinary, and yet very precious to us. Come to today’s Feast,- we call it the Feast of the Most Holy Trinity, a mouthful. I bet, if you asked any of the twelve Apostles about the Trinity, or even asked Mary, Mother of Jesus, about the Trinity, they would look at you, bewildered. 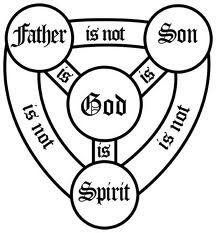 Because the term ‘Trinity’ or ‘Most Holy Trinity’, wasn’t invented until much later. But if you asked them about the reality of God in their lives,- a sense of the Creator of everything, or ‘the heavenly Father’ that Jesus spoke about, -they would say ‘O, yes!’ For the Jewish people (and the Apostles were Jewish, like Jesus, like Mary), the name they had for the One True God was never spoken, but it was ‘I AM’. As simple as that, as profound as that. The God who looked after them, protected them, rescued them, told them ‘I have loved you with an everlasting love, and I am constant in my affection for you’, -this was the God that Jesus loved as a boy and young man. 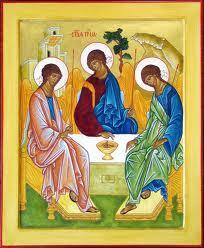 'The Trinity', an icon painted by Rublev. Gospel, Jesus uses the word ‘sent’ about himself, over 40 times, and refers to his ‘Father’ over 90 times. That’s two out of the three that make up the ‘Trinity’. Back again. Remember all the promises of Jesus to his frightened disciples, that he would not leave them orphans, that he would send a Comforter to them, or an ‘advocate’ who would stand by their side always: he would send the ‘Spirit’ to them. ‘Don’t leave Jerusalem’, he told them at the Ascension, ‘until you have received the Promise of the Father’,- namely the Spirit. And the Spirit is the Spirit of God, the Spirit that was and is in Jesus himself, the fire in him, the light and joy and courage and wisdom… and you could go on. The disciples knew all about Jesus. They knew the Creator God, the ‘heavenly Father’ that Jesus showed them (remember the story of the Father of the Prodigal Son,- a parable about God, the Father, yours and mine!). They knew all about the Holy Spirit, because on that Pentecost Sunday, the Holy Spirit of God came on them ‘like tongues of fire’ and shook the whole house, and when they went out from that Upper Room, they were ‘on fire’, and spoke to people in all sorts of languages, the mystery of God. So, when we celebrate today the Feast of the three Persons of the Most Holy Trinity,- three Persons, but one God,- it’s what the Apostles were all about, in the Good News they brought to all the people they met. Do you know your heavenly Father? (He ‘knows the number of hairs on your head ‘ (Matthew 10) ). Do you know Jesus, (do you know him by heart, and not just by head?). He knows you and calls you by name. ‘I know my own and my own know me’- John 10. Do you know the Holy Spirit? You are the Spirit’s Address! The Spirit is a Person inside you, setting your heart on fire. The Spirit is Jesus’ first and greatest gift to us all, to each one and to everyone who asks. Just welcome Jesus into your life, and then watch out! His Spirit will light up your face and eyes and send you into your world. ‘Trinity’? The word? Maybe not. The reality? Yes indeed. ‘Live in me, and let me live in you!’ said Jesus. (John 15:4). Those chapters in St. John’s Gospel,- Chapters 13 to 17- are wonderful food for the heart and soul. Dip into them for five minutes a day, over a time. Invite a couple of friends to do it also, even with you. There’s eating and drinking in them! And share what you find with the few friends who are doing the same. But watch out,- you all could catch fire! Learn more about Andrei Rublev’s icon The Trinity, painted centuries ago in Russia, greatly loved throughout the world. Click here. ← Soul Food for Hungry Adult Communities: Trinity Sunday, May 26, 2013.